Why Sell With Bar None Auction? The Consignment Center tells you everything you need to know to sell successfully with Bar None Auction. 1. Experience: Since 1993, Bar None has been second to none. For more than two decades, we’ve been earning loyal users who depend on our services month in and month out. Our database of 250,000 customers is built on customer satisfaction. 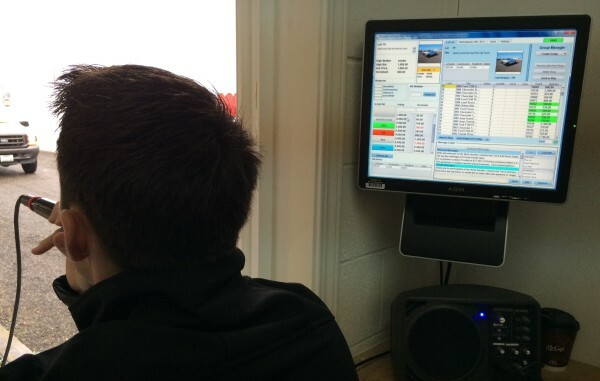 Our industry experience pays our sellers dividends. Because we’ve been doing business so well for so long, our auctions attract serious buyers. 2. Dependability: Buyers and Sellers alike trust our team. Over 22 years of conducting live and online auctions, we have grown deep roots in local communities and across the industry. Our customers know they can depend on the Bar None Auction name and the team behind every transaction. 3. Ease of Use: Our hard work is your smart choice. From initial transportation to final sale, we are a full service, turn-key auction company. Once your assets are in our care, they are handled professionally and proficiently. We manage the details so you can focus on what’s important to you. 4. Flexibility: Bar None Auction provides flexible contract options. Whether it is a straight consignment, cash upfront purchase on inventory packages, Like-Kind (1031) Exchanges or guaranteed sales assurance, we will always tailor a proposal that meets your needs. 5. The Monthly Auction Program: Our monthly auction program gives our customers more opportunities to buy and sell on a regularly scheduled basis. Click the link to learn more about the seller and buyer benefits of the monthly auction model. Listen to the president of Larry Nelson Construction describe his selling experience with Bar None Auction. 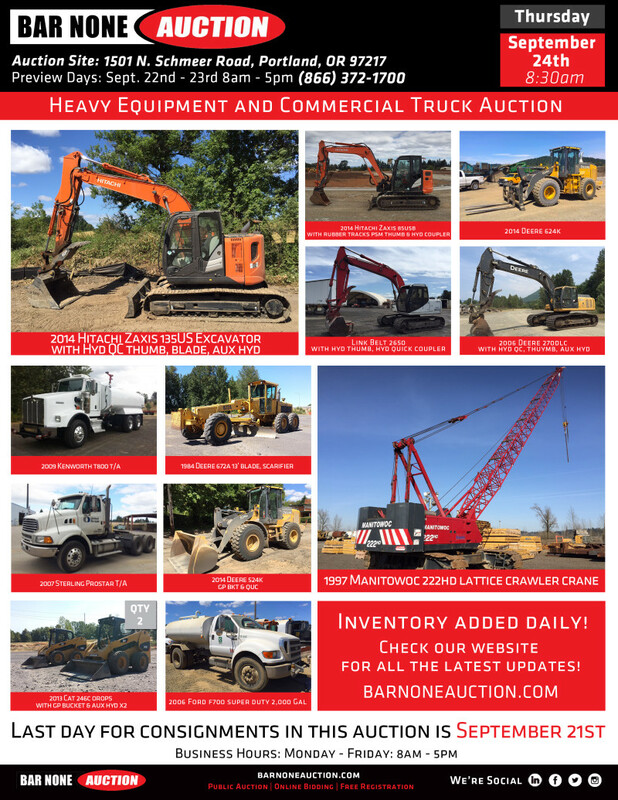 When you sell your equipment with Bar None Auction, your inventory is included in our extensive and targeted marketing campaigns executed for each and every auction. We achieve this through aggressive and thorough methodologies that utilize traditional and digital mediums. Bar None Auction campaigns are always focused and are scaled to match the size of auction. This proven approach allows us to attract the most qualified buyers from around the world and maximizes the results for clients. Bar None Auction operates on an epic scale and delivers huge results. 3 permanent locations up and down the West Coast and a corporate headquarters in the heart of California geographically position us as a powerhouse in the industry. 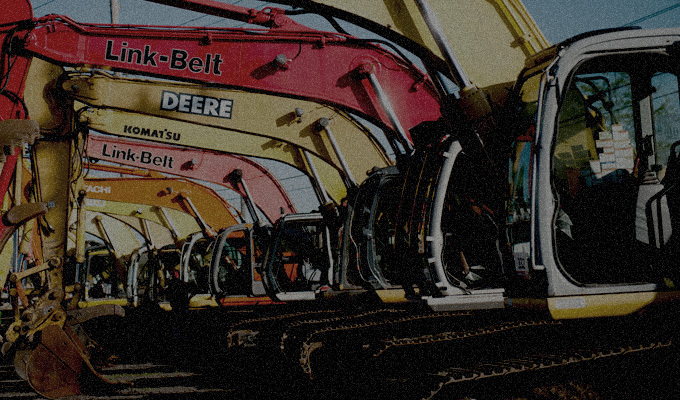 We manage the equipment of every flavor of heavy industry, from multinational corporations to federal agencies, and all the local owner-operators in between. This incredible advantage our users enjoy is built on customer service, rigorous employee training, and a dedicated executive team supporting the auctioneers that make every transaction possible. We achieve real results on the auction block because we know the needs of buyers and sellers. As a privately owned company, we are not beholden to faceless shareholders or a board of directors with profits in mind instead of our customers’ best interests. We believe that in the long run doing right by customers is the best business model. We run a tight ship with a dedicated crew of employee’s whose lives are rooted in the industry because we love Auctions. All of our auctions are globally broadcast live on the Internet through our website. Using the latest in streaming technology and our online registration process allows us to continually match the right products to the right buyers – regardless of their location around the world – and consistently deliver spectacular results that surpass industry norms. This is also a fantastic option for manufacturing/plane equipment or mechanically challenged fleet assets that are oversized or otherwise hard to move, allowing them to remain at your location. We care about every transaction. You will see the founder of Bar None Auctioneering taking care of customers alongside his staff at any event you attend. The leaders of our Sales, Administration, Operations, and Marketing teams work every auction to provide our customers with the best possible service in the industry. 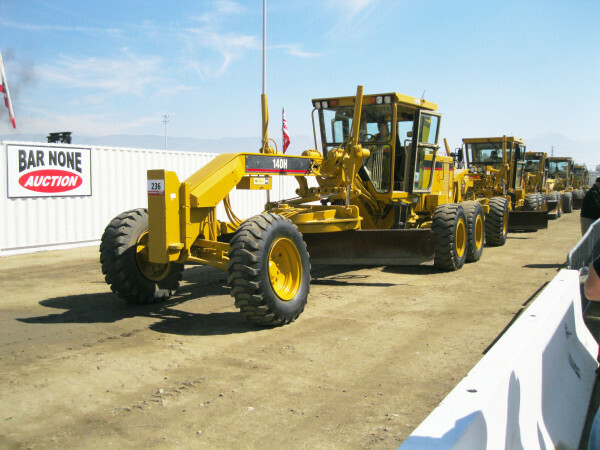 Our Sacramento and Riverside auction sites host 12 events each per year. These top-notch, 20+ acre facilities also house the operational and Territory sales staff to assist you before and after the auctions. Auction Theatre and Ramp – The auction theatre seats thousands of buyers who eagerly anticipate each item as the equipment is driven up and sold on the auction block. Security – Security for your assets is our priority; our spacious facilities are equipped with video surveillance, locking fences and gates, and security personnel. Loading & Unloading – Our loading ramps can stand 12 & ½ ton loads, and our forklifts can handle 9 tons, Cal/OSHA approved. Locked storage areas at our facility protect your property within the gated and secured auction yard itself. Each and every auction has something every buyer wants, no matter what industry they hail from. From commercial trucks to paving and grading equipment, from agricultural tractors to small industrial tools, we bring serious buyers from every walk of business who are serious about filling pressing needs. Getting started is easy. You can contact one of our professional sales representatives in your area or you can fill out consignment agreement.